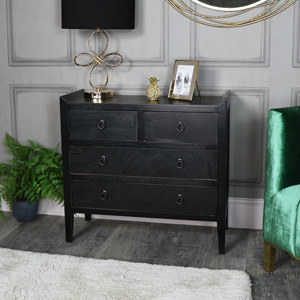 The Mika range is a beautiful collection of painted black, wooden furniture with antique gold distressed edging, raised sides and brass style drop handles. The Mika range has a simple, stylish design with a hint of oriental cool. The Mika range is stunning collection of oriental inspired, wooden furniture with a painted black finish. Each piece is completed with distressed, antique gold edging, raised sides and round brass drop style handles. The Mika range is a super stylish selection of furniture and has a distinctly contemporary design with a vintage twist. There are items in this range designed for bedroom, living room and hallway use. 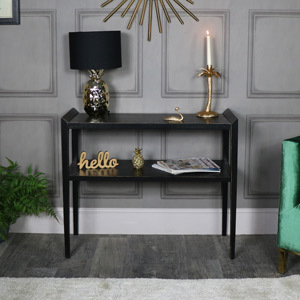 Products included in this range are a large console table, a 2 drawer 2 door cupboard, a lamp/side table and a set of 2 over 2 drawer chest. 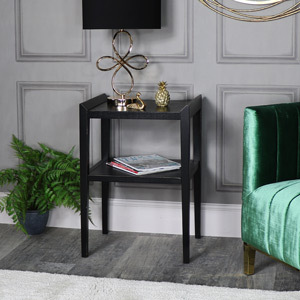 The Mika collections simple design, fabulously dark colour and unique style sets it apart from the rest of our furniture collections. This range can blend into modern, vintage, rustic, industrial or retro interior décor themes and will always stand out from the crowd. Take a look at the full Mika collection and fins the furniture piece of your dreams.